Vegetables, decorations fruits, nuts, herbs, cheese, eggs, etc. Bake Pillsbury™ Grands!™ refrigerated flaky biscuits according to the directions on the package. Allow them to cool completely. Using a round cookie cutter or knife, cut 2 1/2 inch circles out of the center of your biscuits, then cut each biscuit into 2 layers. Create sandwiches by layering one biscuit, some filling, another biscuit, more filling and a top biscuit. Use a spatula or knife to scrape off any filling that has oozed outside of the edges of the bread. Refrigerate for at least 30 minutes and up to several hours. When, ready, make your frosting. Beat cream cheese, sour cream, and a pinch of salt together until nice and fluffy. Remove sandwiches from the refrigerator and frost the sides and top of each. Place sandwich cakes in an airtight container and refrigerate for an hour or up to 24 hours. 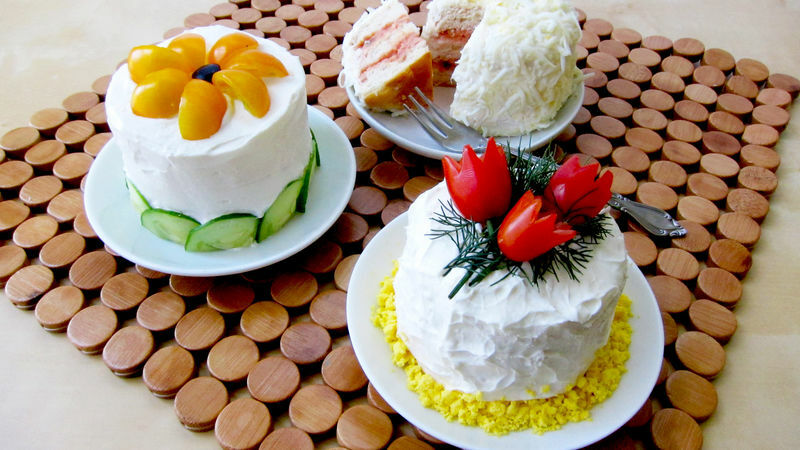 Decorate the tops and sides of the cakes using vegetables, fruits, nuts, cheese, meat, shrimp, etc. If you've used a variety of fillings, you can cut your mini sandwich cakes into slices and serve your guests or simply give each guest one cake to enjoy. Have you ever had a sandwich that has been decorated with a savory frosting and topped with vegetables, fruits, meat, cheese, or nuts? If yes, then you've enjoyed a Smorgastarta, a Scandinavian sandwich cake. These cakes can be extravagantly decorated and filled with equally elaborate ingredients. I'm going to show you how you can take this complicated idea and make it simple by layering flaky Pillsbury Biscuits with ham, chicken, tuna or egg salad, then decorating them with a cream cheese and sour cream frosting along with simple toppings like sliced cucumbers, shredded hard boiled eggs, cracker crumbs, herbs, and vegetables. Start by baking your Pillsbury Biscuits according to the directions on the package. Allow them to cool completely. Using a round cookie cutter or knife, cut 2 1/2 inch circles out of the center of your biscuits, then separate each biscuit into 2 layers. You will end up with 16 biscuit halves. Go ahead and enjoy a little snack. Eat one of the top halves now, if you'd like. You'll only need 15 of the halves for your sandwiches. Create five sandwiches by layering one biscuit, some filling, another biscuit, more filling and a top biscuit. Use a spatula or knife to scrape off any filling that has oozed outside of the edges of the bread. Refrigerate for at least 30 minutes or up to several hours. Depending on how you will decorate your sandwich cakes, you may like to give your frosting some texture. Do so by pressing a spatula or spoon up against the frosting, then lifting up quickly, so that you get spikes. Go all over the cake for a pretty textured look. You may like to add a decorative crumb crust around the sides of the cake. You can use cracker crumbs, Panko bread crumbs, nuts, or chopped herbs. To add crumbs, simply hold them in your hand and press them onto the side of the cake. Continue to turn the cake, adding crumbs as you go. You can even fool your party guests by creating a smorgastarta that looks like a coconut cake, but actually is covered with hard boiled eggs. All you have to do is shred some hard boiled eggs using a cheese grater. I wouldn't grate too much of the yolk, but I found a little yellow mixed with the white looks pretty. Just press the shredded egg all over the tops and sides of the cake. You can decorate the cake or just leave it plain, like I did. Place sandwich cakes in an airtight container and refrigerate for an hour or up to 24 hours. No more than a few hours before your guests arrive you can add your decorations. You can simply cut cucumbers for a border, line the sides of your cakes with julienne cut or even shredded carrots, sprinkle on chopped egg yolks for a pretty yellow border, arrange herbs on top of a cake, create a flower using cut cherry tomatoes and black olives or using almonds and broccoli. To create tulips out of grape tomatoes, use a sharp knife to make triangular cuts all around the top edge. Remove the top half of the tomato and scoop out some of the seeds. Poke a stem of dill into the bottom of the tomato to create a stem. Add more dill under a bunch of flowers. Team Tablespoon was super excited to find Beth’s amazing creations on her blog, Hungryhappenings.com. So, as you can imagine, we are geeked out to have her as a guest blogger. Check out the awesome noms that she made just for us!